Why the Old Mass in Latin? Welcome to the Holy Sacrifice of the Mass at St. Peters Church. You are about to participate in a mode of worship that, until 1964, was in universal usage throughout the Roman Catholic Church for 1,500 years!! We gather here: for the glory of God, the sanctification of souls. We gather in union with the Holy Father, and with the approval of Bishop Howard Hubbard, who established us as a personal parish. That is, a non-territorial parish for all who are attached to the Traditional Latin Mass. We are the only such parish in the Diocese of Albany. We are not attempting to turn back the clock or establish a rival church. And, although many who remember the old Mass may be reminded of happy occasions in their youth, this Mass is not being offered to generate nostalgia. It is being offered as part of the living tradition of the Church. 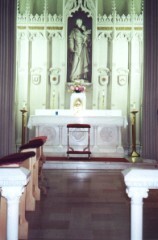 In 1988, Pope John Paul II restored the Tridentine Mass according to the 1962 Missal. We celebrate that Mass here by Papal and Episcopal Indult. Throughout the history of the Church, many Rites have been used to express the Sacred Mysteries of our Faith: Byzantine, Ambrosian, Gallican, and Roman. Today's Mass, called Tridentine because it was codified shortly after the Council of Trent, in the 1570's, is the principal historical Mass of the Roman Rite. Scholars have traced its roots to the very foundation of the Church in Rome!! For those Catholics who have never before seen a traditional Mass--this is going to be a radically different experience from that to which you have become accustomed. And so, we ask you not to judge this Mass by modern liturgical principles--congregational singing, external participation, or vocal dialogue. Participation will be more interior, but no less real; a turning of the mind and heart to Our Eucharistic Lord. You will notice the priest, together with the people, reverently facing in the same direction; toward Christ on the High Altar. The sacred prayers will be said in timeless Latin; the people will be able to follow the English translation in their missals (or Red Books). There will be periods of awesome silence as we enter into the most sacred parts of the Mass. Participate prayerfully in this re-presentation of Calvary. Recall that this is the same Mass that nourished countless Saints, and for which martyrs shed their blood. Thank you for coming. Experience has shown us that a newcomer needs to return for several consecutive Sundays before all the richness of this Rite becomes apparent. May Our Lord bless you abundantly for your devotion to the Holy Mass. Sursum corda. Lift up your hearts. Habemus ad Dominum. We lift up our hearts to God. Gratias agamus Domino Deo nostro. Let us give thanks to the Lord our God. Dignum et justum est. It is right and just.